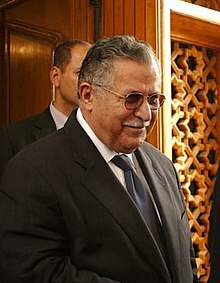 Jalal Talabani (Àdàkọ:Lang-ku Celal Tallebanî, Lárúbáwá: جلال طالباني‎ Jalāl Tālabānī; born November 12, 1933) is the sixth and current President of Iraq, a leading Kurdish politician. He is the first non-Arab president of Iraq, although Abdul Kareem Qasim was half Kurdish. ↑ "Iraqi first lady survives bombing". BBC News. 2008-05-04. http://news.bbc.co.uk/2/hi/middle_east/7382641.stm. Retrieved 2008-08-14.